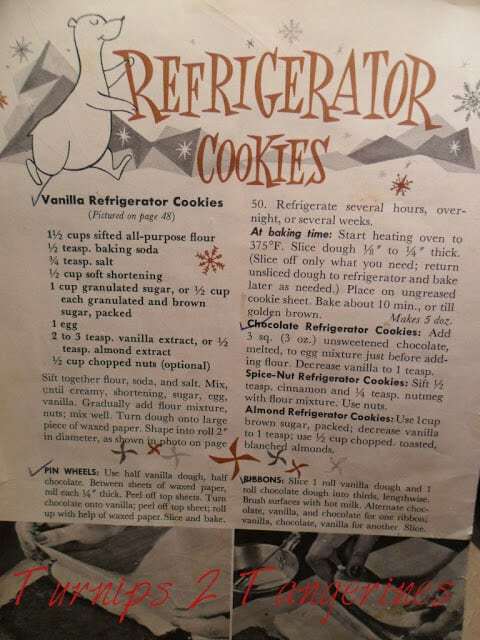 This recipe booklet is from the 1940’s or 50’s, making this recipe very old (like me:) I found this recipe for Vanilla Refrigerator Cookies in a recipe booklet that was my mom’s. When I was young, I thought it was so cool that you could keep the dough in the refrigerator and slice & bake the cookies anytime. I guess you could say that this recipe for Vanilla Refrigerator Cookies is the ‘original’ slice n’ bake cookie. When I was growing up, I would sit in the kitchen, at our tiny table with the white Formica top, with the sides that folded up or down. The small patted chairs went swoosh when you sat down. I sat at that table often while on the phone and page through this recipe booklet. When I was growing up, we were considered ‘lucky’ because we had two phones, one upstairs for ‘us girls’ to use and one downstairs in the kitchen, next to the little white table. Back in the day we had one phone line. If you picked up the phone upstairs and someone was on the phone downstairs, you could listen in on their conversation, if you didn’t get caught. One phone line, in a house full of teenage girls! It’s hard to imagine that, in this day of cell phones. Anyway, I remember being on the phone, sitting at the little white kitchen table, rummaging through the kitchen drawers. No doubt looking for paper to doodle on. An old recipe from the 1940's or 1950's. The original slice n' bake cookie. Combine flour, soda, and salt. Set aside. Beat until creamy, shortening, sugar, egg and vanilla. Gradually add flour mixture, then add the dates and nuts. Mix well. Turn dough onto a large piece of waxed paper. Shape into a rectangle 2-inches in diameter. Refrigerate several hours, overnight, or several weeks. At baking time, heat oven to 375 degrees. Slice dough 1/8 to 1/4-inch thick. Slice off only what you need. Return un-sliced dough to refrigerator. Place slices on cookie sheet lined with parchment paper. Bake 10 minutes or until golden brown. If you have a sweet tooth like I do then you are going to love Pecan Pie Bars. Here are a few more cookie recipes you might enjoy making and eating. Back to School Pencil Cookies and Sugar Cookies with Marshmallow Fluff Frosting.